Movistar Yamaha MotoGP’s Jorge Lorenzo, who struggled in the first unpredictable race at the TT Assen, took the second chance with both hands today and secured tenth position. Teammate Valentino Rossi was riding impressively at the start of the 12-lap sprint this afternoon and was looking to win the race until a crash at turn ten meant the end of his challenge. Dramatic rainfall at the TT Circuit Assen played a big role in the proceedings today. As the first race was red flagged due to weather conditions after lap 14, Jorge Lorenzo and Valentino Rossi had to go out for a 12-lap dash. Lorenzo rode a steady race to claim six vital points for the championship. 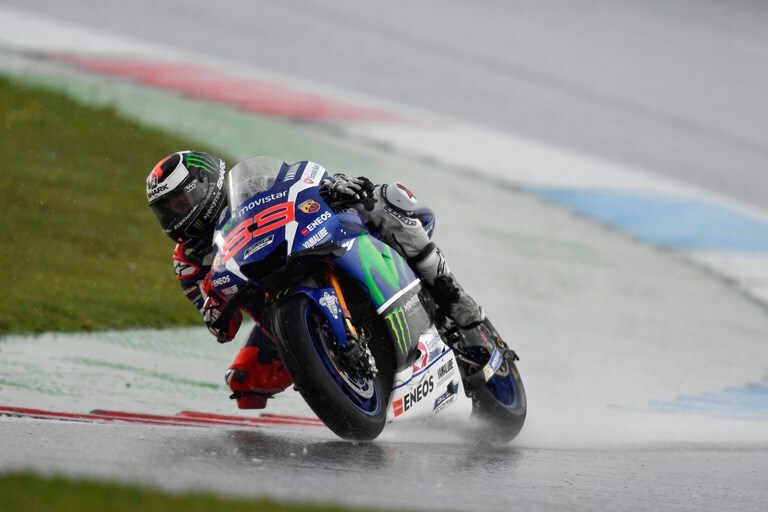 Rossi was unlucky to get caught out by the extremely wet conditions and was unable to complete the race. There was uncertainty before the start of the TT Assen, as black clouds were looming threateningly above the riders’ heads on the starting grid. Jorge Lorenzo had a brilliant start the first time round, moving up from tenth to fifth in the first couple of corners. However, not being able to keep the pace at the front in the treacherous conditions, he made his Yamaha as wide as possible to defend his position but was unable to find a good feeling and held 19th place when the race was red flagged. The race was restarted at 15:02 with the starting grid being based on the position the riders held on the lap 14 standings. Having to commence the 12-lap dash from the seventh row on the grid, Lorenzo also fought bravely during the second part of the race. Similar to the first outing, he had a great start and was able to move up several positions to 13th by the end of the first lap. Though he couldn’t keep up the momentum, he pushed as hard as he could without crossing the limit and took tenth place over the line. Teammate Rossi had a good start in the first part of race from second place on the grid and took the lead coming out of the first corner. He was quick to find a good rhythm, but remained cautious. He kept a steady pace but had to let Yonny Hernandez and Andrea Dovizioso come through as he was trying to get a feel for the monsoon-like conditions. He later regained second place when Hernandez crashed out and at that point Rossi decided it was time to put the hammer down and closed back in to Dovizioso whilst being followed by Danilo Petrucci and Scott Redding. What followed was a tense battle between the top four riders, but it was cut short when the race was red flagged. Rossi again had a good start the second time round, this time from third position, and was lying in second place after turn one. A lap later he was in the lead and soon opened up a gap of over two seconds to his closest rival, until he was caught out by the rain on lap three and unable to continue the race. With a tenth place Lorenzo scores six points and is now 24 points behind Marc Marquez whilst holding second place in the championship standings. Rossi remains third in the rankings, 18 points behind his teammate. Monster Yamaha Tech3 team rider Pol Espargaro equalled his best result in the premier class with a 4th place finish in a drama filled and soaking wet Motul TT Assen in front of 105,000 passionate fans. The Spaniard leapt forward when the lights went out at the beginning of the wet race and he carefully navigated around the circuit on the first lap which he completed in 8th. Then, shortly after, Espargaro dropped back six positions yet, he stayed focused and stuck into a consistent pace, which allowed him to move up to 9th by the midway point as he steadily made progress. However, by that time, the weather conditions were considerably worse which lead to the Grand Prix being red flagged. A shortened sprint of 12 laps resumed shortly afterwards and he got straight back to work before concluding the opening lap in 6th. With a third of the total distance left to run, Espargaro slotted into the final podium position as he continued to push, before eventually crossing the line in 4th, closing an incredibly challenging round 8 battle. Meanwhile Bradley Smith’s hopes of a strong result were dashed at the wet Dutch Grand Prix after falling on the 16th lap shortly after the race recommenced. The young Briton began the GP from 13th on the grid and he was shuffled back one position by the close of the first lap. Smith persevered as he launched into his recovery campaign and consistently progressed before clinching 12th when the red flag was shown. Nevertheless, the 25 year old lunged forward at the restart and moved up to 7th, yet his luck ran dry on the following lap as he fell at the 15th corner. He nursed his Yamaha YZR-M1 back to the pits and then bravely re-joined the Grand Prix and sealed 13th.